[prMac.com] Reston, Virginia - Software and Computer Systems Company, LLC, (SCSC) has released Phoenix for Mac OS X, version 2.1. 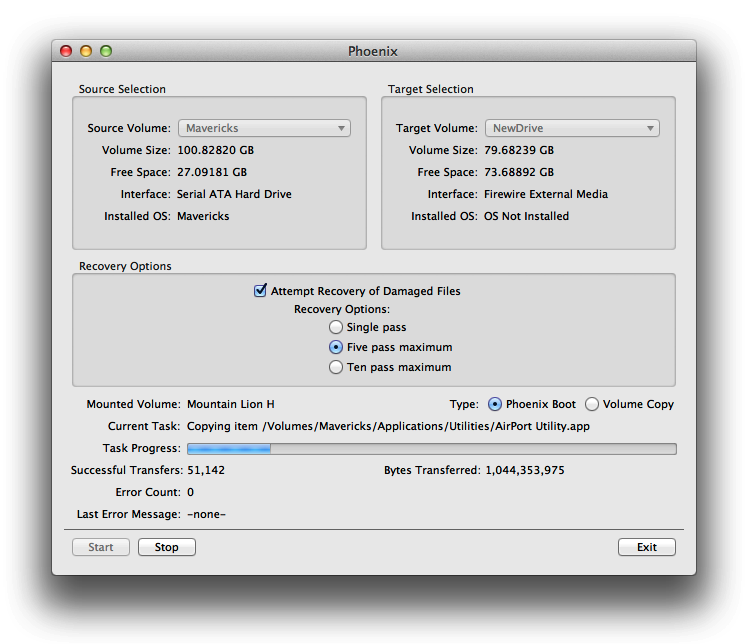 Phoenix is an operating system tool that allows users to perform basic volume cloning, attempt data recovery from damaged drives, create emergency boot volumes, and re-install the operating system onto a new drive if needed. This particular release also has performance improvements specifically implemented to improve the product's performance under El Capitan (Mac OS X version 10.11). "With this release of Phoenix, we have improved the products performance when performing volume cloning and recovery options primarily under El Capitan," stated Bill Wagner, the owner of the company. "The performance improvements will also help speed up all operations on earlier versions of OS X, but they will be most noticeable under El Capitan. For users that already own a copy of Phoenix, they should receive an update notice via e-mail within the next few days. As usual, the update will be free of charge to currently licensed users." Phoenix was originally developed to do two things: perform basic volume cloning with user configurable recovery options, and create an emergency boot volume to host our Scannerz line of system and hard drive testing tools. The basic cloning option allows a user to clone one volume to another, and if the drive or SSD has problems, it can attempt to recover damaged files. If a file on a damaged drive or SSD can't be recovered, Phoenix will flag it in a log file allowing the user to identify which files need to be replaced or completely discarded as appropriate. Unlike other tools, Phoenix will not quit or give up if errors are detected, it will proceed with the cloning operation until all viable data is copied to another drive. In essence, Phoenix can step over the bad files allowing a user to get as much information off a bad drive as possible. Needless to say, if the source drive is in good condition, the operation is really just a normal volume cloning operation. "The emergency boot volume, which we call a Phoenix Boot Volume is created by extracting the core operating system right off of an existing, installed operating system without needing to download a new OS copy or use install media. The boot volume can also be used to re-install the operating system by extracting the core operating system components from itself and then installing them onto another drive." continued Wagner. "Phoenix is our second best selling product, right after the Scannerz line of products. Many people simply want a simple, low cost tool to do basic cloning and liked the idea of having one that could still access a drive or SSD that's having problems." Phoenix may be obtained as a stand alone product for $13.95 (USD) or it may be obtained as part of the either of the fully featured versions of Scannerz, but not Scannerz-Lite. Software and Computer Systems Company, LLC (SCSC) was formed in 2005. It is legally licensed to do business as a limited liability company in accordance with the laws of the State of Virginia. Originally, SCSC focussed on producing its own line of cross platform software tools using Java. The applications consisted of performance enhancing application tools, engineering and scientific tools, and tools for the medical sciences. In 2008, SCSC changed its focus and became dedicated primarily to developing products for use on the Mac OS X and iOS operating systems. SCSC's product line up for Mac OS X currently consists of Scannerz with FSE, Scannerz with FSE-Lite, FSE, and SpotOff with Spot-O-Meter. Scannerz is a hard drive scanning tool, FSE is a file system events monitor, and FSE-Lite is a less capable version of FSE and is included in all base versions of Scannerz. SpotOff and Spot-O-Meter allow a user to control and monitor Spotlight activity. Copyright (C) 2005-2016 Software and Computer Systems Company, LLC. All Rights Reserved. Apple, the Apple logo and Mac OS X platforms are trademarks of Apple Inc. in the U.S. and/or other countries.